Unless you insist on wearing the latest designer attire, a night at the opera doesn't need to be an expensive affair. Some of Europe's best opera houses are trying to fight the idea that going to the opera is an activity reserved for the rich by making it affordable for everyone. 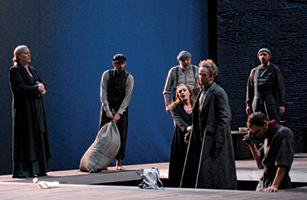 The Frankfurt Opera has an Opera for All program that offers decent seats for a fraction of their regular price. In 2009, you can see Verdi's A Masked Ball and Strauss's Elektra for as little as $20 (or $13, if you're happy to sit a little further back). For other selected productions, families buying one full-price ticket can get up to three free for children under 18. That includes tickets to certain performances of The Magic Flute, A Masked Ball, The Marriage of Figaro and Cinderella. (For dates go to www.oper-frankfurt.com.) But if even those prices are too steep, here's a tip: the Frankfurt Opera advertises its productions by broadcasting them live via loudspeakers in the forecourt. Milan's world-famous Teatro alla Scala gives a 25% discount on any tickets that haven't been sold one hour before the show. The safer bet, though, is to try to buy one of the 140 gallery tickets  ranging in price from $7 to $16  that La Scala holds back for every performance. In order to get hold of one of those, visitors must show up several hours in advance to have their names listed (for more details go to www.teatroallascala.org). Next season's highlights include Daniel Barenboim conducting Wagner's Tristan und Isolde, and the internationally acclaimed Daniele Gatti conducting Verdi's Don Carlos. In Paris, the Opera Bastille makes available 62 standing-only tickets, at $7 each, for every show. They can be bought at ticket machines one-and-a-half hours before the curtain rises. And thanks to arm and seat rests, standing through a performance is more comfortable than you might expect. The must-see shows of the coming season include The Magic Flute, The Cunning Little Vixen and Madam Butterfly (see operadeparis.fr). As for that designer attire, just don't forget to wear your sensible Guccis.